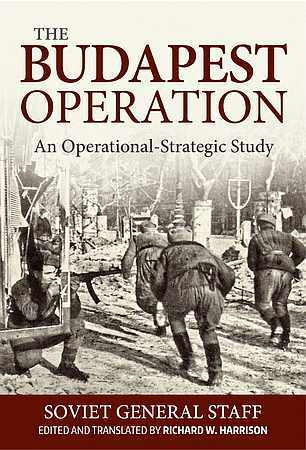 The Budapest Operation (29 October 1944-13 February 1945): An Operational-Strategic Study examines in detail the Red Army's operations on the approaches to Budapest and the city's ultimate capture following a long siege. The first part of the study deals with the Red Army's arrival in central Hungary, following the successful conduct of the Iasi-Kishinev operation in late August 1944 and the subsequent development of the offensive through Romania, Bulgaria and eastern Yugoslavia. By mid-October the Soviets were poised to continue the offensive into Hungary and its capital of Budapest, the capture of which would clear the path for a subsequent advance into Austria and southern Germany. This study examines the rapid advance to the outskirts of Budapest, where stubborn German-Hungarian resistance forced them to halt, after which the Soviets sought to surround the city, finally closing the ring at the end of December. Also examined are the Germans' repeated attempts to break the siege by launching several counter-offensives to the west and south of the city. However, these were all beaten back in heavy fighting and the enemy garrison was forced to capitulate on 13 February. This study also devotes considerable attention to the combat arms (artillery, tanks and mechanized forces, aviation, and engineering troops) during the operation. The other study is an internal General Staff Academy document dealing with the activities of the Third Ukrainian Front during the Budapest operation. Throughout the greater part of the operation the Third Ukrainian Front played a decidedly secondary role, charged with protecting the flank of the Soviet advance through Yugoslavia and Hungary, with the Second Ukrainian Front slated to receive the accolades for taking Budapest. However, the bitter enemy resistance along the approaches to Budapest gradually forced the Soviet high command to increasingly shift its efforts to the right bank of the Danube River, first to help in isolating the Budapest garrison inside the city, and then to fend off repeated German counter-offensives to relieve the city. It was the Third Ukrainian Front's successful repulse of these efforts that enabled the Soviets to finally bring about the garrison's capitulation and the end of the operation.